If you’re a traditional photographer using film rather than digital it doesn’t take too long to work out with a pocket calculator or on the back of an envelope that you can save a lot of money over a period of time by buying all or most of your film stock in 30.5m/100ft bulk rolls. The initial cost of the loader and a supply of re-loadable film cassettes have to be taken into account, but their costs diminish with each bulk load used. The savings may appear marginal at first – if you think your film usage is not that great – but when you consider that over a period of several years you may use a lot of film then the savings become more apparent. As an extreme example, but true nevertheless, I have exposed certainly more than 10,000 films in the 30-year period between 1975 and 2005. Of that total, around 8,000 films were monochrome, the remaining 2,000 being colour transparency. At a rough guess 80% of all those films were loaded from bulk rolls – which provides some interesting cost breakdowns. As I cannot remember or accurately guess the prices of films from the mid-70s onwards I’ve taken two typical discount film prices from a) 20-years ago and b) from the current Silverprint, London, UK http://www.silverprint.co.uk as my guides. 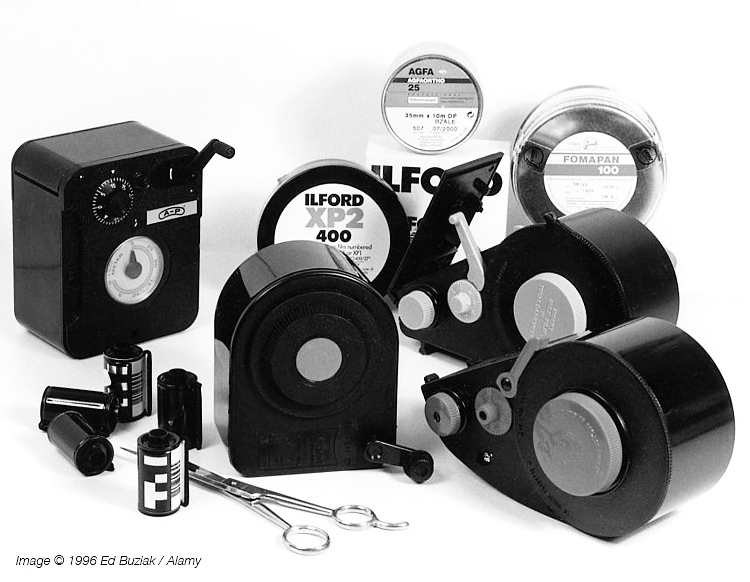 Calculating from prices 20 years ago… of my 8,000 mono films approximately 6,500 were from bulk – therefore I bought 360 bulk rolls to load eighteen 36-exp films per 100ft roll. At prices 20 years ago of say £33 for a 100ft roll of Fuji Neopan 400, that equates to a total cost of about £12,000. If I’d bought 6,500 factory loaded cassettes they would have cost me slightly over £21,000. So by adopting a bulk-loading policy early on in my photographic life I saved around £9,000. Using the current Silverprint catalog prices… of my 8,000 mono films approximately 6,500 were from bulk – therefore I bought 360 bulk rolls to load eighteen 36-exp films per 100ft roll. At the current price of £57.20 for a 100ft roll of Ilford HP5+ 400, that equates to a total cost of almost £20,600 in round figures. If I’d bought 6,500 factory loaded cassettes at the current price of £5.70 each they would have cost me slightly less than £37,000. So by adopting a bulk-loading policy early on in my photographic life I saved around £9,000… and if doing the same at current prices I would potentially save almost £16,500. The more I stare at these calculations the more compelling digital photography becomes! Maybe I’m rewriting the death-knell for your own traditional film preferences! My use of colour transparency emulsions showed smaller savings. Of around 2,000 films used in that same period 1,500 were from bulk loads and 500 bought off the-shelf. The cost of say 1,500 rolls of Fuji Velvia from bulk back then would have been £6,000 (66 x 100ft rolls) whereas the factory loaded cassettes would have set me back £8,000 at £5.33 per cassette… or an extra £2,000. At the current price of £8.33 per cassette from Silverprint (100ft bulk rolls are unlisted) the pro rate savings would be more than £3,000. Taking the cost savings further my current Computrol bulk film loader which is still in use after 20 years or so, and which cost around £15 in 1976, must have seen 6,000 rolls through it and has therefore cost me a minuscule one quarter of a penny per roll loaded. All these figures are meaningless, however, if you simply don’t trust your own abilities to load film or have done so a couple of times and experienced scratched and ruined frames or entire films on each occasion, to say nothing of the photo opportunities lost forever. The above heading is the one supreme rule for this technique. When you consider that a single, tiny speck of grit caught in the velvet or fabric light-trap of a standard film cassette can scour a line the entire length of the film as it’s being loaded, another line as it’s being advanced in the camera, a third line as the exposed film is being rewound into the cassette and, unfortunately, if you load a processing spiral directly from the cassette a fourth line as you do the latter… then it’s understandable that the practice is shunned by many and unmentioned by those too embarrassed to retell their fate. I’m most familiar with the Computrol loader and have had no problems with it in two decades of use. Any scratching problems I’ve experienced have always been traced to the film cassette’s fabric light trap rather than the gate in the loader. My original Computrol was made by Restem in Israel although the current model is made in the UK from the same basic mouldings. American photographers will be more familiar with the Watson loader which is very similar in operation. Both have a mechanism where by twisting the rim of the film chamber a gate opens to allow clear passage from bulk roll to film cassette. Although the Watson has a much wider clearance in the gate at 30mm, compared to 7mm in the Computrol the difference is of no practical advantage since a 1mm clearance is enough to prevent film scratching if the loader’s design is correct. The Watson has a hinged cover to the film cassette chamber (which means you can’t loose it in the dark) and is lifted by a cam which cannot be activated until the film gate is closed tightly across the film, thus removing any possibility of accidental fogging of a 100ft bulk roll. This loader also has a data panel for details of film speed and type, number of films loaded, date, etc… a feature none other has. Practice with an old length of 35mm film to perfect the only tricky operation… that of threading the film’s leader through the gate or trap to the cassette chamber. Do this a few times in normal room lighting to see exactly how and where the leader has to go and repeat the process a few times with your eyes closed until confident. You’ll also need a few other items… a supply of film cassettes, a roll of 1/2” wide masking tape, scissors, a dark-changing bag (if you’re not using a darkroom), labels and lintless cotton gloves… any hiccup in the procedure and your hands will sweat with fear! I’ve tried both plastic and metal cassettes and have to say that the metal ones feel safer. Plastic ones usually have a nib on the screw-cap which can easily be knocked, with the cap turning ajar, whereas metal ones have to be prised off with the thumb. The velvet or felt light-traps always have to be examined closely between loadings and carefully cleaned with a blower or a strip of low-tack masking tape slid through the gap to pick up any stubborn grit, hair or dust. And keep a note of how many times you use your cassettes and discard them after about ten re-loadings. Better safe than sorry. There are fewer emulsions available from major film manufacturers nowadays but your favourite emulsions should be available in 30.5m/100ft bulk rolls at an attractive saving to your overall photographic costs… search on-line for the best deals. If you do shoot film there is a compelling argument to reduce film costs over a period of several years. However, with digital you can shoot hundreds of images in a day, retain the ‘keepers’ on your computer… and reuse the disk in your camera. For me though, photography is more about emotion than money… and handling film is still emotive. I am not saying your information isn’t solid., however what if you added a title that grabbed people’s attention? kinda plain. You should peek at Yahoo’s home page and watch how they create post headlines to get people to open the links. You might add a related video or a related pic or two to grab readers excited about what you’ve got to say. Only yesterday I noticed on Tumblr a photo of a large Ilford film product display in a Japanese camera store with the comment about “recent doubling of prices”… perhaps I follow you on Tumblr (your name is familiar) and it was yourself who posted the photo?